The Top End XLT Handcycle has been engineered for the total recreational experience. Available with 7 speeds, it is the ultimate choice for recreation. The Excelerator XLT's lightweight oval tube aluminum frame with chrome-moly steel fork features simple geometry for maximum stiffness and smooth cornering. 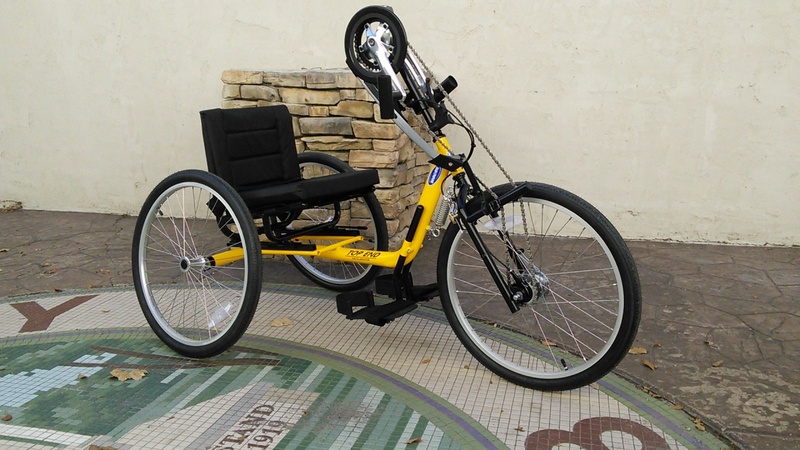 The low seat and recumbent handcycle design enhances aerodynamics and the 15 degrees of camber increases stability. The tall, narrow back offers the maximum range of motion and increased power transfer. This extremely stable and maneuverable three-wheel handcycle is capable of speeds up to 20 m.p.h. If you want a great way to exercise, cross-train or just have fun, the Top End XLT is what you're looking for. 6061 T-6 oval tube aluminum frame with a 4031 chrome-moly steel fork for strength and stiffness, powder coat paint. Adjustable crank height assembly, adjustable fore and aft seat position, multi-position, adjustable footrest system with safety straps. Adjustable tension seat upholstery, narrow tall padded back with adjustable height seat. Quick-release axles, high performance spoked wheels,high pressure tires, reflectors, parking brake and chest positioning strap. Vertical ergonomic handles, Shimano(TM) 7-speed internal hub with reversing drum brake, full chain guard, cushion and safety flag.